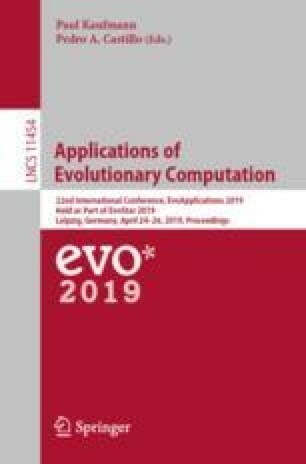 In this paper we present the results on applying evolutionary computation techniques to construction of several cryptographic attacks. In particular, SAT-based guess-and-determine attacks studied in the context of algebraic cryptanalysis. Each of these attacks is built upon some set of Boolean variables, thus it can be specified by a Boolean vector. We use two general evolutionary strategies to find an optimal vector: (1+1)-EA and GA. Based on these strategies parallel algorithms (based on modern SAT-solvers) for solving the problem of minimization of a special pseudo-Boolean function are implemented. This function is a fitness function used to evaluate the runtime of a guess-and-determine attack. We compare the efficiency of (1+1)-EA and GA with the algorithm from the Tabu search class, that was earlier used to solve related problems. Our GA-based solution showed the best results on a number of test instances, namely, cryptanalysis problems of several stream ciphers (cryptographic keystream generators). The study was funded by a grant from the Russian Science Foundation (project No. 18-71-00150). The authors would like to thank Daniil Chivilikhin, Maxim Buzdalov and anonymous reviewers for useful comments.